Like a fierce tree falling in the woods, if Naomi Campbell doesn't appear at New York's Olympus Fashion Week, does the event make a sound? No need to consider that head-scratcher this season because the London-born legend is scheduling to strut the catwalks at Bryant Park for designers Rosa Cha, Tommy Hilfiger, Chris Aire, Heatherette, and Anna Sui. (Plus, she's donating all of her Fashion Week earnings to Hurricane Katrina relief funds.) 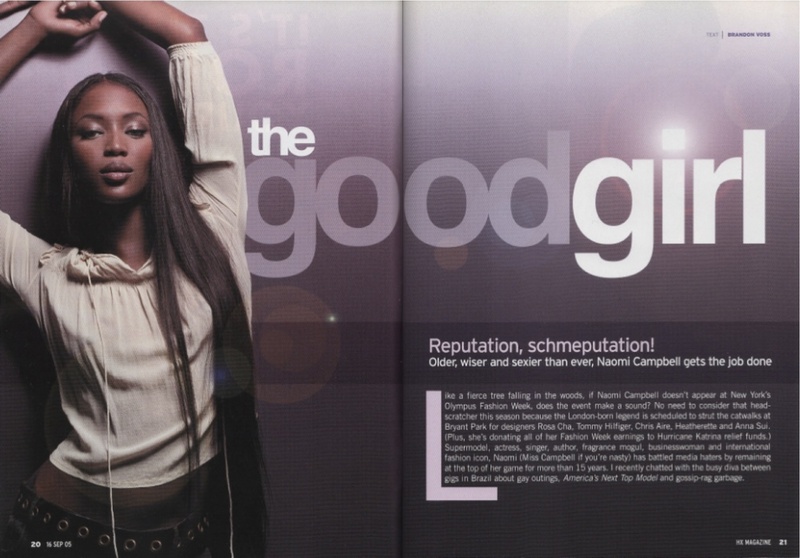 Supermodel, actress, singer, author, fragrance mogul, businesswoman, and international fashion icon, Naomi (Miss Campbell if you're nasty) has battled media haters by remaining at the top of her gam for more than 15 years. I recently chatted with the busy diva between gigs in Brazil about gay outings, America's Next Top Model, and gossip-rag garbage. HX: Hi, Naomi! First things first: What are you wearing? Naomi Campbell: A white bathrobe. I'm sure it looks glamorous. We're so thrilled to have you grace the cover of our Fashion Week issue! Are you ready to work the runways? I actually hope I can walk because I had an accident two days ago. I chipped a bone in my ankle, so I'm in an ankle brace right now. But they said I'll be okay by the time I get to the shows. Oh no! How did you do it? I turned to my left and my ankle just buckled. In a pair of Nike sneakers — not even in high heels, which I love! [Laughs] But it's going to be fine. I certainly hope so, because I imagine that all designers must want you to walk for them. I love doing shows, but at this point in my life if they say, "We've seen her, we know her, we don't need her," I'm fine about that too. Because I'm not a new spring chicken on the block. Nonsense! But you're producing shows now as well through your branding and events company, NC.Connect. NC.Connect basically gets peoples' products where they need to be, anywhere in the world. It's something that I opened really just for my friends and it grew into something else. We've been producing Rosa Cha since he came to New York, and it's been successful. It's beautiful Brazilian bikinis and the girls are wearing minimal, so people want to come to that show for whatever reason! [Laughs] Also, I have my own bathing suit line that they manufacture. What else do you plan to do while in New York? Hit some clubs? No, I'm getting old, over the hill. I like to go to dinners, I love to invite friends over to the house and cook, movies... That kind of stuff is where I'm at right now. I'm getting a bit more, I don't know, chilled out, I guess? I just don't find myself going to nightclubs so much because I find that I can't hear anybody! I did go to a great bar [last spring], though. I went to xl with Rob [Shuter], my publicist, on a Saturday night and I had so much fun. He told me that you also stopped by Splash. Well, we couldn't get in because it was Men's Night — and I respect that, that's cool! Might you go back to xl during Fashion Week? Yeah, if Rob has time on his hands and wants to go out, I'll go back there because everyone was just so pleasant. I wouldn't exist — my whole life, my whole career wouldn't exist [without gay men]. I'm definitely for gay marriages. I've always been raised in a way that I don't discriminate against anybody or anything. As long as you love life and you live it the best you can and respect people, that's the best you can do. I know you have a number of gay friends who are quite famous. I just have friends that I love. And those that I've lost... Gianni [Versace], I miss so much. I just loved his openness, his boldness. I learned a lot from him. I imagine most straight men — and women, too — are probably intimidated by you. Are you kidding me? Because you're so gorgeous, for starters! That's not true. You know what? Don't judge a book by its cover. Whatever my occupation is, I'm still a human being, and I still have feelings and emotions. I'm very sensitive. Naomi, if you had your own reality show, I'd TiVo it religiously. Have you been approached to do one? Oh, boy, I've been asked a lot recently. If it's done in terms of my work and my business, that's fine. But I don't want to put my personal life out there because it's bot fair to people who are in my life. I've always wanted to do Saturday Night Live. I love doing skits; I think it's hysterical. You have to know how to make fun of yourself. People who really know me know that I love to do that. But people who don't, well, they're going to think otherwise. Not everybody's going to love you. I know that. How do you feel about America's Next Top Model? I think it's fantastic. It gives someone a chance that might not necessarily get into the doors of a modeling agency or meet a scout. Shows that give people an opportunity, I love. Janice Dickinson claims to be the world's first supermodel, but I say it was you. Thoughts? No, I will agree with Janice. I don't really care about the terminology of "supermodel." Every model I know, we're working as hard as each other. It's not like we've better or we've got superpowers. But I really do miss the days when Linda, Christy, Cindy, Stephanie, and I would all be in Milan, because it really was like a girls' dormitory. It was a lot of fun. I have great memories. Do you still keep in touch with the girls? I do, yeah. What's fun is when they ask us to do a picture together for something. It's like a reunion party! Everyone's still in the business in some way, and they're doing what they want to do. Some have families — I don't, so I still travel a lot — but when it gets to that point where I will have a family, my life is going to change completely. And I'm all ready for it, but things happen when it's the right timing. Finally, I know the media have been giving you a hard time again recently over an alleged scrap in Rome, but I want you to know that your gay fans are behind you 100 percent. Is there anything you'd like to say about that drama? No, there's nothing to say because it didn't happen. It's not the first time I've been targeted, and I know how to deal with it now. I just don't have anything to say. Fair enough, girl. Well, I do hope we can convince you to party with the boys when you're in town! Okay! I'll talk to you during Fashion Weekend!